The Boss Dogg is a redneck dream come true. It "Speaks the Language" with volume, dimension and clarity that is unmatched. It comes with a wireless random motion decoy that can be placed 30 yards from the speaker. And you can control it all from 200 yards away. Who's the Boss Now. Want proof that this is the best sounding Predator deceiving unit on Earth EVER. You know what your favorite song sounds like. Well, play it through the Boss Dogg. Try this with other units and you will hear the difference. The BOSS DOGG doesn't give you just individual sounds to choose from, it has Expert Hunts which allow you to have Randy Anderson and other Team Primos members actually calling for you. These are proven hunt sets that get dogs in. Powered by three 50 watt Class-D amplifiers, there is No Distortion. Simple to use remote can be operated quickly with one hand and has a range of 200 yards. 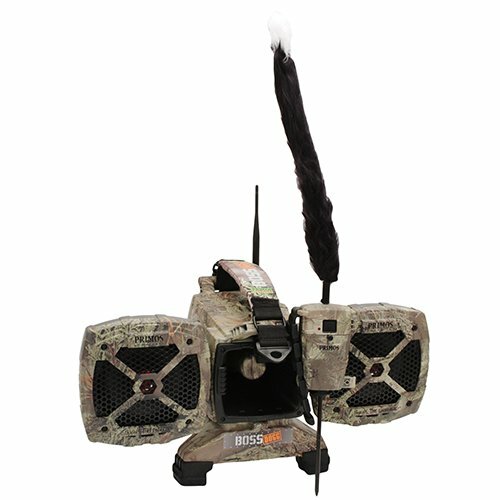 Remote sound list is displayed on 2.5" full color LCD screen and sounds are organized by species such as coyote, fox, deer, etc. Comes with 100 sounds and 8 complete Expert Hunts. The Primos Sound Library allows you to add sounds and other newly released Expert Hunts. Stores up to 2000 sounds on 4GB of internal memory. Comes in Realtree MAX-1 Camo design. Includes padded shoulder strap. Speaker Operates on 8 'D' Cell Batteries. Remote Operates on 3 'AA' Cell Batteries and Decoy Operates on 4 'AA' Cell Batteries (not included).